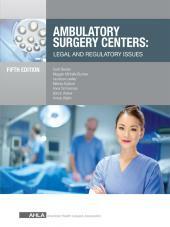 Ambulatory Surgery Centers: Legal and Regulatory Issues addresses the unique nature of ASCs, emphasizing their physical and organizational separation from other providers, regardless of whether they are owned by a hospital, a physician practice, or other entity. In this newly-revised and updated edition, the authors address the history behind the development of ambulatory surgery centers (ASCs) and their rapid growth since Medicare approved payments to them in 1982. Today there are more than 5,900 ASCs operating in this country. This edition of an established bestseller provides background on the development of ambulatory surgery centers (ASCs); their rapid growth since Medicare approved payments to them in 1982; and current issues facing ASCs operating in the United States. 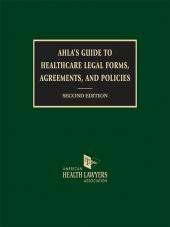 All health attorneys and others in the health care field who need to understand the often unique nature of ASCs should welcome the unparalleled guidance provided here by leading experts in the field. The title includes annotated sample forms, including a compliance plan for ASCs, and an operating agreement, among others. Scott Becker is a partner at the Chicago office of McGuire Woods LLP and practices exclusively in the healthcare regulatory and transactional area. He devotes his efforts to surgery center, hospital and healthcare provider related transactions, joint ventures, securities, contracting and regulatory matters. He provides counsel to hospitals, ambulatory surgery centers, surgical hospitals, pharmaceutical companies, multi and single specialty medical practices, and a variety of healthcare industry entrepreneurs. He provides service on a national basis to privately held and publicly traded companies relating to healthcare transactional and regulatory matters, including counsel under the Medicare/Medicaid Fraud and Abuse Statute, the Stark Act, and the Internal Revenue Code Sections 501(c)(3) and c(9). Sarah Abraham Chacko practices health care law in Chicago, Illinois. Ronald E. Lundeen, Jr. practices health care law in Chicago, Illinois. Elissa Koch Moore is an associate at the Charlotte, North Carolina office of McGuire Woods LLP and focuses on corporate services and transactional and regulatory matters for healthcare providers and companies. In this capacity, she concentrates on acquisitions, divestitures, mergers, private offerings of securities, governance and corporate formation issues, and joint ventures. She has counseled ambulatory surgery centers, hospitals, physician groups and other healthcare providers with respect to Medicare and Medicaid fraud and abuse laws, the Stark Act, tax-exemption issues and general healthcare compliance issues. Melissa Szabad is a partner at the Chicago office of McGuire Woods LLP. She counsels and advises clients on an array of corporate and regulatory matters, including healthcare fraud and abuse, compliance, physician self-referral, professional standards, governmental reimbursement, facility licensure and accreditation, formation, merger and acquisition and joint venture transactions. Gretchen Heinze Townshend is an associate at the Chicago office of McGuire Woods LLP and focuses on corporate healthcare transactional work and regulatory matters. Her experience includes representation of various types of healthcare providers including hospitals, health systems, dialysis facilities, multi and single specialty medical practices, specialty hospitals, ambulatory surgery centers, and a variety of healthcare industry entrepreneurs, in sales and acquisitions, joint ventures, general corporate matters, contracting, securities, and regulatory matters. Amber McGraw Walsh is a partner at the Chicago office of McGuire Woods LLP and focuses on corporate healthcare transactional work and regulatory matters. Her experience includes representation of various types of healthcare providers including hospitals, health systems, dialysis facilities, multi- and single-specialty medical practices, specialty hospitals, ambulatory surgery centers, and a variety of healthcare industry entrepreneurs, in sales and acquisitions, joint ventures, general corporate matters, contracting, securities, and regulatory matters.